Jason Kent Bateman, nado o 14 de xaneiro de 1969 en Rye, Nova York, é un actor, director e produtor estadounidense de cinema e televisión. Empezou actuando en televisión a comezos da década de 1980 na serie Little House on the Prairie e nas comedias de situación Silver Spoons e The Hogan Family. Na década de 2000, acadou sona por interpretar o personaxe de Michael Bluth na serie de televisión Arrested Development, polo que gañou un premio Globo de Ouro e un Satellite. Tamén protagonizou filmes como Juno (2007), Hancock (2008), Up in the Air (2009), The Switch (2010), Paul (2011), Como acabar co teu xefe (2011), The Change-Up (2011), Identity Thief (2013), Bad Words (2013), Horrible Bosses 2 (2014), The Gift (2015) e Zootopia (2016). 1984 Knight Rider Doug Wainwright Episodio: "Lost Knight"
1986 Mr. Belvedere Sean Episodio: "Rivals"
1986 St. Elsewhere Tim Moynihan Episodio: "You Beta Your Life"
1986 The Wonderful World of Disney Steve Tilby Episodio: "The Thanksgiving Promise"
1988 Our House Brian Gill Episodio: "The Fifth Beatle"
1995 Burke's Law Jason Ripley Episodio: "Who Killed the Movie Mogul?" 1995 Hart to Hart Stuart Morris Episodio: "Secrets of the Hart"
1996 Ned and Stacey Bobby Van Lowe Episodio: "Pals"
2000 Rude Awakening Ryan Episodio: "Star 80 Proof"
2003 The Twilight Zone Scott Crane Episodio: "Burned"
2005 The Simpsons El mesmo (voz) Episodio: "Home Away From Homer"
2005 King of the Hill Dr. Leslie (voz) Episodio: "The Petriot Act"
2005 Justice League Unlimited Hermes (voz) Episodio: "The Balance"
2005 Saturday Night Live Convidado Episodio: "Jason Bateman/Kelly Clarkson"
2005 The Fairly OddParents Tommy (voz) Episodio: "Oh, Brother!" 2006 Scrubs Mr. Sutton Episodio: "My Big Bird"
2013 Yo Gabba Gabba! Bateman Episodio: "Super Spies"
2015 The Muppets El mesmo Episodio: "Pig's in a Blackout"
2017 Nobodies El mesmo Episodio: "Mr. First Lady"
↑ Smith, Patrick (22 de maio de 2013). "Jason Bateman interview: 'Arrested Development gave me a new life'". The Daily Telegraph. Consultado o 6 de xullo de 2017. 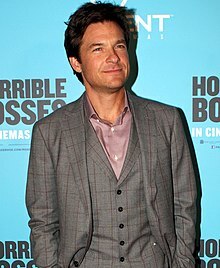 Jason Bateman na IMDb (en inglés).